Today is my rest day from riding, and instead I did some gardening with my father-in-law. The "planting" we were doing involved, quite literally, breaking rocks with a pick in the hot sun. It was fun! It was fun because I only do that sort of thing once a year or so. Let's not dwell on it. Instead, some notes on my recent bike upgrades, which I put together the very first day we got to the house. Priorities! It's my ridiculous city bike. This thing rocks. I've taken a basic 5-speed city bike and added just enough parts to make it into a happy set of wheels for Syros. Thanks to a botched attempt to pull the freewheel on my last trip (Maillard; the proper removal tool is very hard to find), I bent the old wheel's axle. Because this was a bike that was brought to the island from the US, it has 27" wheels, virtually unknown on the Continent. So I had Overtime Sports in Coquitlam dip into their dwindling supply of 27" rims and build me a freehub-based wheel. This solved several problems: carrying a complete bike to Greece (something I seriously contemplated) could have been close to $200 and would have been a logistical nightmare. It fixed the broken axle. And it allowed me to add much lower gearing, something I badly needed considering the hills that every ride begins and ends with. As best as I can figure, the concluding climb is about 40 minutes long averaging a 10% grade. It's murderous even with my new 32-cog. I have left the steel front wheel alone. It works fine, and the biggest problem with steel rims is terrible wet-weather braking. Since it only rains about three days a year in Greece (and has rained on me 15 minutes in the 10 weeks or so I've spent here over the years), that's not a big problem. I'll just stay home on the rainy day. To go along with the big new cog, I needed another rear derailer. The incredibly cheap Shimano "SIS" (TY-2200, I think) derailer is ugly and heavy, but works perfectly. It was in my parts pile. The key feature is it has the right kind of derailer hanger for the cheap old hanger-less bike. A new SRAM chain mates with the 8-speed cassette, an 11-32 SRAM. I also added a saddle from my pile, as the old one was a nasty sprung saddle, large and uncomfortable. The Avocet R1 has been retired from cyclocross racing, owing to being bent by repeated rough re-mounts. It will experience considerably lighter duties on the island. I also brought some saddle mounting hardware, but not a post: it's the original steel post with removable bits at the top, sort of like the latest in integrated seat masts. I bring clipless pedals every year, and then take them home after my vacation. Crank Brothers Candy pedals, this time. To-dos: the bars should be dropped or flipped. The bottom bracket is making ominous noises, and deserves an overhaul, and possibly a replacement. If I decide to replace the BB, then the crank will have to go as well, and if I do that, I would put a cheap compact double (or more likely a really cheap mountain-bike triple) on it, and add a front derailer, and use that moment to add downtube shifters, since I'd need to add a front shifter, and the old shifter doesn't have enough cable pull to move across 8 gears (I just get 12-32 on the very wide cassette. I've never missed the 11). 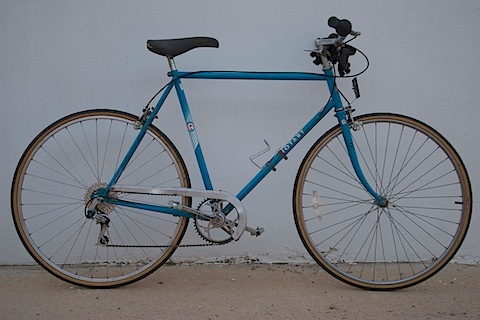 And before it got any further than that (front wheel, drop bars) I'd just get a different bike. 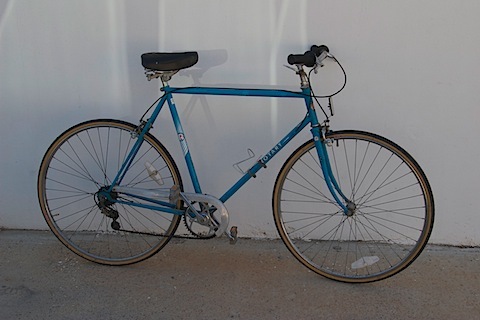 In its present state, it does very well at its simple job: taking me up and down the hills of Syros so I can get my secret training in. Your bicycle is still providing you good service ,that good so never sell it as my view,If you have any problem regarding it just change its part ,it will cost you minimum than ever buying a new one. Your bicycle is still providing you good service ,that good so never sell it as my view,If you have any problem in it just change its part ,it will cost you minimum than ever buying a new one. It is very informative blog.Thank you for the brilliant blog. It is impossible to find such variety of information anywhere else. I really appreciate your great knowledge. Thanks for sharing.